I'm a big fan of summer movie season. I've always enjoyed movies in general, but I've never been a capital-F "Film-lover" type. Sure, I appreciate a good arty or independent movie, but I've never taken a film class, nor have I seen Citizen Kane or Lawrence of Arabia. As such, I tend to see more movies in theaters in the summer than during the winter awards season (not to mention the difference in free time I have in the summer vs. December and January). I also, having stolen the idea from a friend, run a Summer Movie Draft, where five of us draft a "team" of summer movies. 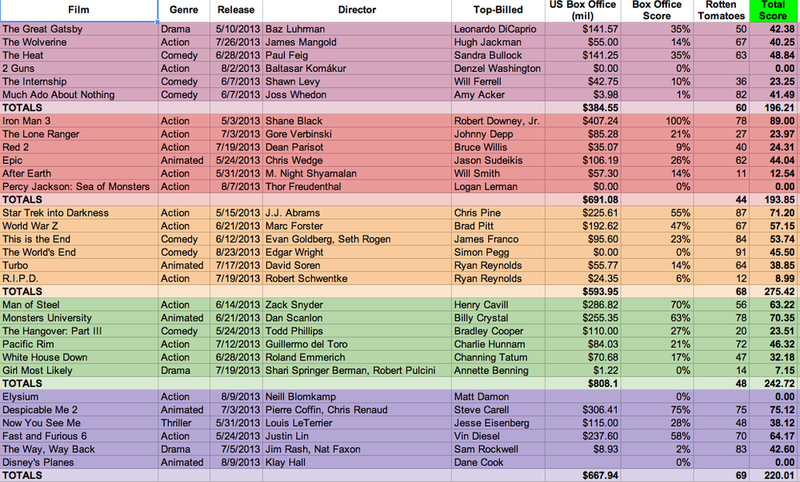 We then give each movie a score, based on how well it does at the box office, as well as its Rotten Tomatoes score. Below are two screenshots, one of last year's results, and one for this summer's contest. My team was the purple, helped by a mid-season acquisition of Magic Mike. Still a couple weeks to go, and a more wide-open race without anything as huge as Avengers. All this to say that I spend a lot of time thinking about summer movies, especially the blockbuster types that tend to dominate the box office all summer. What surprised me this summer was the extent to which Man of Steel under-performed, despite its massive marketing push and pre-release buzz. Yes, it made a lot of money, and there's already a sequel planned, but the critical response was tepid, with only a 56% rating on Rotten Tomatoes. Superman is clearly a well-known and beloved property, more so than the Avengers or Iron Man. So why did Man of Steel fail where those others did so well? Most of the complaints about Man of Steel are with the film's third act, in which (spoiler) the entire city of Metropolis is leveled, mostly because of Superman. Geeks complained because this was out of character for Superman, who is known for defending as many civilians as he can, no matter what the cost to him. While there are legitimate concerns about what this means for Superman's character, the biggest problem is that this was simply a bad choice for the story. There was certainly plenty of action in the last 40 minutes of Man of Steel, and ostensibly that's what summer moviegoers are looking for. Yet for all the punching and flying and explosions and destruction, the finale of Man of Steel was undeniably boring, in a way that other explosion-packed finales are not. We know Superman is essentially invincible, so any story featuring him must have stakes other than simply his survival. Superman and Superman II accomplished this by having Superman saving Lois Lane and other civilians, or by taking his powers away temporarily. In Man of Steel, director Zack Snyder and screenwriter David S. Goyer instead place the survival of the entire planet, and especially Metropolis, at stake. The problem is, we viewers cannot really comprehend or relate to planetary stakes. A good story can make us care about whether certain characters live or die, but an entire city or planet? That's more difficult. The Avengers faced similar difficulties in last summer's blockbuster. Again, the entire planet was at stake, with the battle for its survival taking place in New York City. I think there are a couple reasons why the final act of The Avengers (mostly) works, where Man of Steel does not. One, the characters are more vulnerable. While we know intellectually that none of our heroes will die, they are all (except Thor) mostly human. Sure, there's a high-tech suit of armor and a giant green rage monster, but their basic humanity gives them a vulnerability that Superman lacks, at least in this most recent version. The team dynamic of the Avengers also keeps the action from getting stale. It's not a question of whether the superheroes will defeat the supervillain, but how they will do it. They even spend some time figuring out how to keep civilians safe, something Superman does not seem to consider. The stakes are still too high to be comprehensible, but the script keeps things interesting. Man of Steel is relying on the action sequences of one super-strong alien flying and punching another super-strong alien to be entertaining enough, but without any connective tissue, it feels rote. Action is not a substitute for the emotional response that moviegoers crave. With modern CGI, the action is easy. But relying on it at the expense of plot or characters isn't going to work, no matter how popular the superhero. And while my wonderful assistant principal may disagree, I don't think that Superman is being held to a different standard than the Avengers. The problems in Man of Steel are problems of execution. The best summer movies, the ones that appease both the hoi poloi and the critics, are the ones that understand Raymond Chandler's advice: the action has to be a means, not the end. Class of 2013, blissfully unaware of their futures. Spring. It’s graduation season, and commencement addresses are one of my guilty pleasures. Perhaps it’s because my college graduation had a poor speaker (“Don’t waste your life marketing hairspray,” she said to the dozens of marketing majors hoping to work for Procter & Gamble). Or maybe I am hopelessly trying to cling to my youth, remembering when I was a naïve young graduate ready to conquer the world. Either way, I enjoy a good commencement address. Each May I again read David Foster Wallace’s classic “This is Water,” or Steve Jobs’ address at Stanford, both of which are really the pinnacle of the genre. F. Scott Fitzgerald once said, "Yeah, this should definitely be in 3D." No, what he said was, "[T]he test of a first-rate intelligence is the ability to hold two opposed ideas in the mind at the same time, and still retain the ability to function." That's what you have to do: you have to be confident in your potential, and aware of your inexperience. And that's really tough. There are moments when you'll have a different point of view because you're a fresh set of eyes; because you don't care how it's been done before; because you're sharp and creative; because there is another way, a better way. But there will also be moments when you have a different point of view because you're wrong, because you're 23 and you should shut up and listen to somebody who's been around the block. As somebody who has long suffered from “Smartest Guy in the Room Syndrome,” I wish I’d been able to internalize this advice sooner. I’m still decades away from having enough wisdom to give a commencement address of my own, but I’ll add this to the list of things I wish somebody had told me when I was young(er) and stupid(er). I’m a nerd, always have been, and presumably always will be. As a kid, my nerd interests of the moment almost always involved collecting things. First, it was Transformers—the original Transformers, not Michael Bay’s bastardized explosion-fests. Then, I became a voracious reader, with shelves and shelves lined with Star Trek and Star Wars books, neatly arranged chronologically or alphabetically, depending on my mood. In fact, it turns out that all this collecting may be in my genes. I recently spit into a test tube and mailed it off to 23andMe. While I wait for them to analyze my DNA, the 23andMe website has a series of surveys to entertain me, and to be used for various research projects. Some of the surveys ask obvious questions about my health–those are boring. The much more interesting ones are the personality surveys. So far, I’ve learned that I am introverted (no kidding) and neurotic (yep). Relevant to my nerdom, I scored highly above average on the “Systemizing Quotient”, which means that I am quite driven to arrange or reduce things into a system. This isn’t surprising, and probably explains a lot about my various geek tendencies over the years. I am genetically predisposed to collect and organize things. With all of this being said, it’s a bit surprising that I never really got into comics as a kid, seeing as that seems like a hobby tailor-made for a kid like me. I had a phase, but it was not particularly long-lived. I picked up the Death of Superman TPB at K-Mart (not exactly a local comic shop), and I followed the various Supermen stories that came out of that for a while before I got bored. I was also a big fan of the X-Men, but I just couldn’t keep up with all the titles. I would watch the cartoon, and then be massively confused by all the different characters in the comics. I still remember one issue that I bought primarily because it had a shiny cover. I was thoroughly confused, and went back to following comic book movies, but not comic books. I received a copy of Marvel: The Untold Story for my birthday, and it actually explained why, despite all signs pointing to me being a childhood reader of comics, it never came to pass: comic books weren’t very good in the 90’s. There seems to be a consensus that the quality of comics has improved lately, and indeed, my semi-dormant nerd genes have awoken in a way not seen since I amassed a triple-digit DVD collection in college. I’m reading comics. A sample of my collection. I’ll put the quality of Saga, All-New X-Men, or Hawkeye up against anything on the bestseller lists. Even my skeptical wife plowed through the entire run of Y: The Last Man and eagerly awaits new issues of Saga. And for somebody like me with so little time to read for pleasure, 22-page issues are the perfect mental health break. At first, I was reluctant to admit that I Read Comics, but now I’ve embraced it. I’m a Collector, and right now that means collecting (digital) comics. It’s in my genes. You know that feeling that sets in every Sunday evening? That anxiety/sadness that settles like a lump of poorly-digested Chipotle in your stomach at the knowledge that your weekend is over? Well as a teacher, I get nine weeks of vacation. So now that my final week of “freedom” has arrived, I have that same Sunday Night feeling, except it will last all week and is magnified by a factor of nine. Happens every year around this time. It’s not that I dread going back, exactly. I like my job–most of the time. It’s more an anxiety borne from not having completed the myriad things I had hoped to achieve this summer, both for business and pleasure. Books unread, planning unfinished, video games unbeaten. Once August hits and the meetings resume and the students return, the feeling fades away. I will resolve that next summer will be more productive and more relaxing at the same time. So it goes. I recently returned from a four-day trip to my hometown, St. Louis, Missouri. Most of my family has moved away, but it's always nice to visit my grandmother and to eat some St. Louis-specific meals. Having lived in Denver for three years now, the differences between the two cities felt even more striking than when I last visited two years ago. The architecture of the homes in the two cities is a very visible point of distinction, and one that speaks to some of the underlying differences. Obviously, St. Louis is a much older city, and like in many other old river cities (Cincinnati, for example), there are a lot of old brick buildings. Driving through St. Louis and it's near suburbs (within I-270, at least), even the newest housing developments are often at least 30 years old. In the city itself, of course, many homes were built a hundred years ago. Driving down a residential block, you see small ranch homes, tall row houses, and towering estates, often on the same block. While the older neighborhoods of Denver have similar aesthetics, you see a lot less brick and lot more communities of cookie-cutter houses–two-story homes with three-car garages and small yards. Of course, having grown up in a house built in 1957, and then also lived in a home built in 1920, some of the "charm" of an older house is overwhelmed by the quotidian reality of old wiring and older plumbing. Still, driving down a street in the Tower Grove neighborhood of St. Louis or Old Town Florissant is very different from Highlands Ranch or even southeast Denver. Another feature (bug?) of cities like St. Louis or Cincinnati is the diversity of neighborhoods. Not just the traditional ethnic enclaves like "The Hill" in St. Louis, but the distinctions between Clayton, Tower Grove, and University City. Growing up in St. Louis pre-GPS, I could usually tell in what direction I was driving based on the changes in neighborhood. Not just going from "nice" neighborhoods to poorer ones, but the way the businesses and homes would change from north to south, or from east to west. I realize that I probably have not lived in Denver long enough to see some of these same variations, but I don't think it's a stretch to say that this phenomenon is more obvious in the Midwest than in Denver. Walking and driving through the St. Louis area last month, even parts that I wasn't really familiar with growing up, it all felt like St. Louis. There was no time when I could have convinced myself that I was actually in Denver. Maybe it was the humidity. Maybe it was the architecture. But I felt the same way living in Cincinnati or western Massachusetts. Maybe it's all just a factor of Denver's relatively young status as a major city. Or perhaps it's the itinerant nature of Denver's population through the years, that it's difficult to have a Denver-specific culture when so much of the population is new to the area. As much as St. Louis will always be my "hometown," even though my parents moved away six years ago, there is also a certain sadness that the city evokes when I return. Those gorgeous brick buildings are often in areas hit hard by crime and poverty. The decline of North St. Louis and North County is also the story of much of the Midwest, the story of urban decay, of "white flight." The story of St. Louis is also the story of the auto industry, of McDonnell-Douglas and Anheuser-Busch, Boeing and In-Bev. It is the story of Catholic immigrants, of assimilation and segregation. When you talk to a native Midwesterner about their hometown, whether it be Cincinnati, Memphis, or St. Louis, invariably it turns to the past. Statistics about when St. Louis was the third-largest city in the country, or when Cincinnati was the hub for trade in the Midwest. In those descriptions of past greatness, there is certainly nostalgia, that "pain from an old wound" so eloquently described by Don Draper. There's also a feeling that we do not want our cities, our hometowns to be mortal. We want them to be preserved exactly as we remember them, because as these great American cities decay, they take with them a piece of us, those who lived there, and also a piece of American history.